In this high-energy interactive performance, Braima Moiwai brings to life the Mende oral traditions of storytelling in Sierra Leone, West Africa. Using Djembe drum and other instruments to accompany sing- alongs and sound effects in his stories, the audience are captivated and engaged. Participants will learn drum talk, West African culture. Braima shares stories from his childhood growing up in the rice fields. Questions and Answers finale. 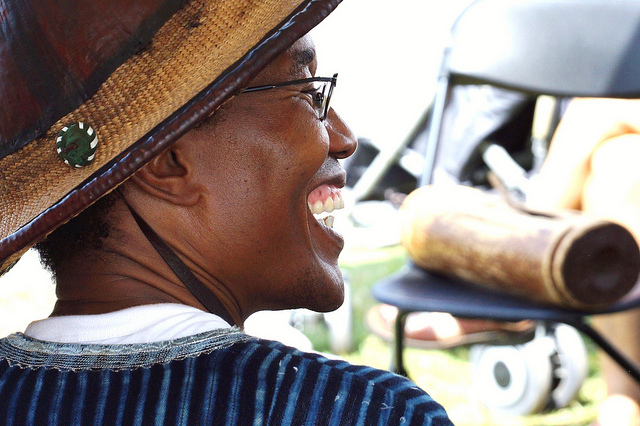 This residency crosses the Atlantic Ocean by connecting the traditions of West Africa with the South Carolina Sea Island culture through games, stories and songs from Mende- land. The Mendes are the largest of the fifteen ethnic groups of Sierra Leone, West Africa. Special Requirements (Space, Tech, Volunteer): A large room/classroom for students to move around. Learn the arts and stories that bond African Americans with West Africa. You will learn drumming techniques, games, folk- tales, dance and the influences of African languages (over 4,000 words! )on American English, while Braima relates his boyhood experiences growing up in West Africa. Special Requirements (Space, Tech, Volunteer): A large room to allow for movement. Braima will share with students the art of batik, gara, and shibori cloth making using “adinkra” symbols, geometric figures and other patterns to make a quilt or wall hanging for their school. Students will explore the cultural context of traditional cloth design techniques from around the world that express family status, emotion, and political themes. Special Requirements (Space, Tech, Volunteer): A large room/large kitchen with sink, water. Workshop Fee: Contact CAPS Office at 919-560-2718, instructional and material fees vary based on project scope and number of participants.